BigCommerce software is one of the most popular e-commerce solutions. Rich set of features, flexible customization opportunities and user friendliness let BigCommerce appear in the top ten lists of various reviews. BigCommerce makes first-timers feel comfortable and does not require much effort and technical knowledge to create and customize an online store. It is loaded with features, which are built into it in a form of apps or can be easily integrated. However, having a perfectly built online store is not enough in today’s world of competition. When your prospects land on your store they expect not only responsive design and affordable pricing but also great customer service. Doug Warner once said “In the world of Internet Customer Service, it´s important to remember your competitor is only one mouse click away.” That is why it is important to equip your website with right tools which will help to survive in this world of competition. Live chat solution has been gaining popularity among consumers and has become part of most e-commerce websites. According to Forrester 44% of online consumers find live chat very important feature which lets contact online store support with a click in the middle of purchase. How does live chat help businesses? 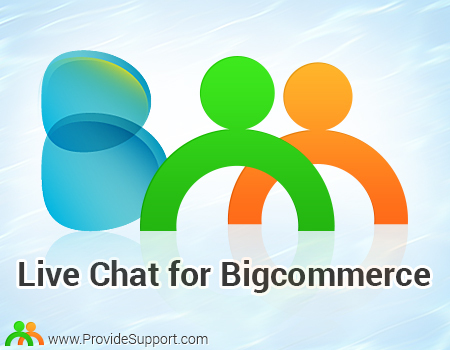 Provide Support Live Chat software provider offers fast and seamless live chat for BigCommerce integration. Just a couple of easy steps and your website is equipped with cutting edge communication technology. You just need to add chat button code and the customizations of your chat window will be picked up by the script. To choose a chat icon image, please do the following: in your Provide Support account Control Panel follow My Account / Account Settings / Images page and select a set images for your chat buttons. You can take a look at the available Live Chat buttons in our gallery. To add a chat button code, please follow to My Account / Chat Button Codes page and choose there ‘Fully Featured Chat Button Code with Uploadable Online / Offline Images’. Copy the code. In your Bigcommerce admin panel, please follow Advanced Settings and choose Live Chat from the drop down menu. Then on the appeared screen select ‘Other Third Party Live Chat Service‘. Open ‘Other Third Party Live Chat Service’ tab there. Insert there the code you generated on the Step 2, choose ‘At the top of the page’ option for your chat button location (in general there is no difference which one you choose as the chat button appears in a fixed position) and click ‘Save’. To appear online and start assisting your online shoppers download the operator console and log into it with your credentials. Customize your live chat look and feel with different customization options available in your Provide Support account Control Panel. That’s it! Just a couple of easy steps and your customer care team is online and ready to help your online shoppers. This entry was posted in Articles, Instructions, News and tagged bigcommerce chat, bigcommerce live chat, live chat and bigcommerce integration, live chat for bigcommerce, live chat tool bigcommerce. Bookmark the permalink.